Now that Checkers for Android supports a position setup editor, analyzing textbook studies has become a lot simpler. This has increased the significance of the small built-in endgame tablebases of my app as well, as can be seen in the study below. Here, starting from what is known as the "first position" in checkers, Checkers for Android, playing with the black pieces, announces its inevitable loss in 30 moves! I finished a position setup feature for Checkers for Android, similar to what was already in Chess for Android. This feature allows users to copy interesting checker problems from textbooks or other sources and play from there to improve their game. In addition, I added an option to show the square labels to make playing out variants from textbooks a bit easier for players that are less familiar with the numbering scheme. Since I recently also added a feature to export games as PDN, this implied I also had to implement FEN setup for games that do not start from the initial position. An example is shown below (note the FEN tag, and the empty first ply since it is white's move in the given position). Although the Certabo electronic boards are mainly intended for chess, the flexibility of the identifying chips makes them suitable for 8x8 checkers as well (draughts, or American checkers, with slightly different rules from e.g. 10x10 international checkers). 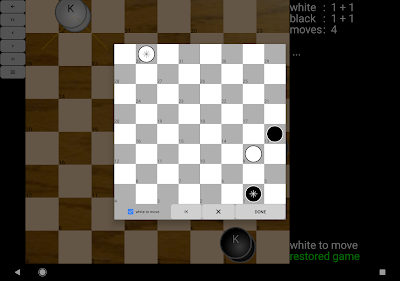 Therefore, I am planning to add support for Certabo boards in Checkers for Android as well. The 34 identifying chips can be used for the 24 regular pieces and 10 kings for promotion (using special purpose pieces avoids stacking the regular pieces). 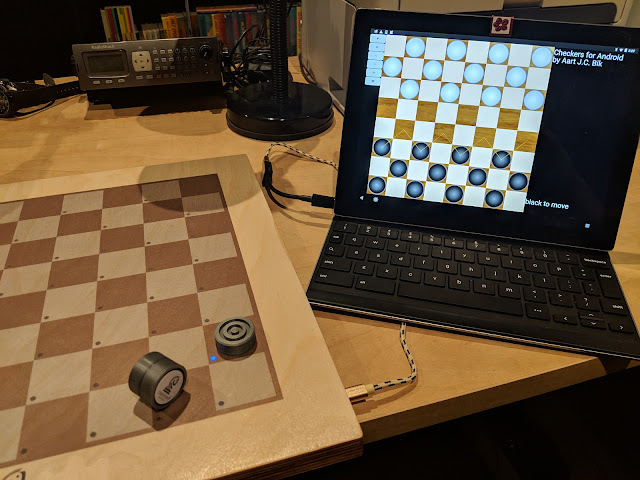 A 3D printed set can be used for this purpose (a continued hat-tip to my brother-in-law Gerard Harbers for making all the chess and checkers sets for me!). The general idea is illustrated with this picture. Please let me know if you like this upcoming support!